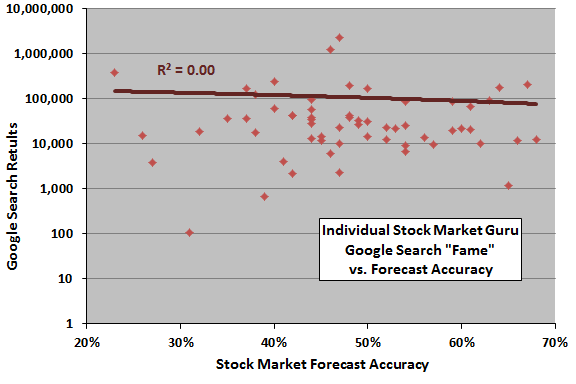 The following scatter plot relates attention (number of Google search results on a logarithmic scale) to U.S. stock market forecasting accuracy for 60 individually graded gurus. The Pearson correlation for the two series is -0.05 and the R-squared statistic is 0.00, indicating no material relationship between attention and forecasting accuracy. 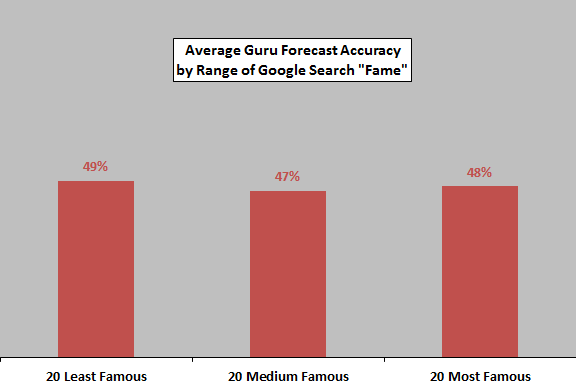 For another perspective, consider average guru forecasting accuracy by range of guru fame. The next chart summarizes average guru forecasting accuracy for three ranges of guru fame as measured by number of Google search results. Average accuracy is consistent across ranges, again indicating that famous gurus are no more or less accurate than obscure ones. For a third perspective, the fame-weighted average accuracy of all 60 gurus is 46.4%, compared to a raw average of 48.0%. Given the sample size, these averages are not materially different. In summary, evidence from simple tests on a limited sample indicates no relationship between the forecasting accuracy of and the attention paid to U.S. stock market gurus. It seems that other factors drive investor attention, which tends to concentrate on a very few gurus. As noted, sample and subsample sizes are small. The significance of this analysis depends on the reliability of judgments in Guru Grades regarding guru forecasting accuracies and on the meaningfulness of a definition of attention based on Google search results. Google search results for a given guru can vary considerably over time, with variation perhaps deriving from news spikes or changes in search technology.